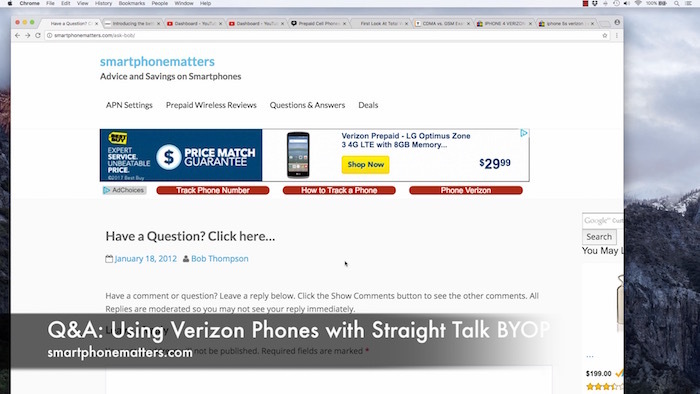 In today’s video I answer a few questions about using Verizon phones with Straight Talk’s BYOP Plans and talk about using an iPhone 4 with Verizon Wireless Prepaid. I am so thankful for your web site as it’s a new discovery for me! The world of Pre pay is new as well! I signed up for ST after being w/Verizon (postpay) forever. I purchased the 30 day card at Walmart. So far it’s been ok, just ok…. My question is: My phone settings (Verizon phone) have Roaming on. Do I leave it on with Straight Talk? Also, do I turn WIFi off when I leave the house? You can leave the roaming setting on and not have a problem. If the AT&T or T-Mobile network work well in your area, you have even more options.